KINGSPORT, TENNESSEE – The United Ways of Northeast Tennessee kicked off fundraising campaigns across the region on Thursday, August 17, 2017. In an event hosted by HomeTrust Bank and the United Way of Greater Kingsport (UWGK) at MeadowView Conference Resort and Convention Center, goals for all six Northeast Tennessee United Ways were announced, with a regional goal of $7.4 million. Jamie Woodson, CEO of the State Collaboration on Reforming Education (SCORE) was the keynote speaker for the event. United Way’s new message is “United We Fight, United We Win.” Dollars raised in each of the community campaigns remain in the region, going toward the work of nonprofit organizations and community impact initiatives that support the health, education, and financial stability of the members of each community. 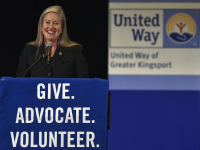 This new message was the theme of the kickoff, with United Way of Greater Kingsport Executive Director Danelle Glasscock, welcoming 300 guests and sharing the new brand credo. Eastman Director of Technology and 2017 UWGK Campaign Chair Bill Trapp, then announced the campaign fundraising goals for each community: United Way of Greater Kingsport, $3.6 million; United Way of Bristol TN/VA, $1.1 million; United Way of Elizabethton/Carter County, $130,000; United Way of Greene County, $580,000; United Way of Hawkins County, $195,000; and United Way of Washington County, TN, $1.8 million. The cumulative regional goal is $7.4 million. Individuals, companies, or organizations interested in learning more about United Way’s work or investing in the community through United Way are encouraged to contact their local United Way for opportunities to GIVE. ADVICATE. VOLUNTEER.